Taxation plays a very important role in the returns generated by your investment and so you should know how the investment is taxed before you choose one. 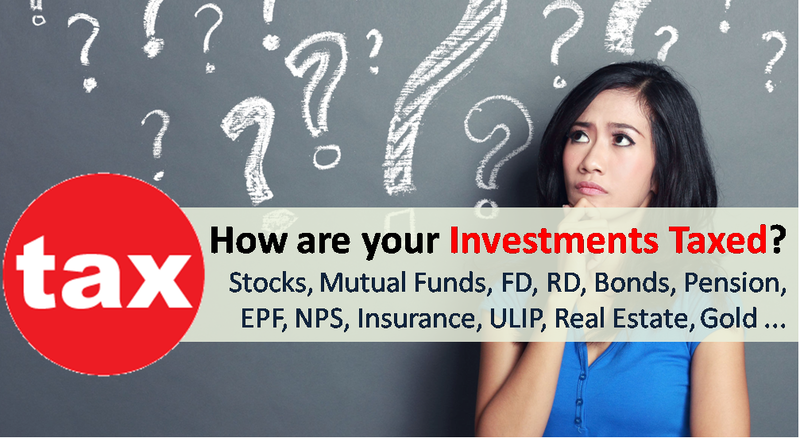 We list down the most common investments and how they are taxed? Interest earned in Saving bank account up to Rs 10,000 is exempted from tax u/s 80TTA. Any interest more than Rs 10,000 is added to your income and taxed at income tax slab rates. There is NO TDS on interest earned on saving bank account. This is also applicable for Post Office Savings Account. Also Read: Which Bank offers Highest Interest on Saving Bank Account? The entire interest earned on Bank FD is added to the income and taxed according to the income tax slab rates. However from FY 2018-19 interest income received from Bank/post office FD/RD is tax exempt up to Rs 50,000 under new Section 80TTB. TDS of 10% is deducted if the annual interest exceeds Rs 40,000 (changed in Budget 2019) and Rs 50,000 in case of senior citizens. Interest across all Fixed Deposit/ Recurring Deposit accounts across all branches of a bank is taken into consideration to arrive at the total annual interest figure for TDA. If NO PAN is linked to the FD account the TDS rate is 20%. Budget 2015 made the tax and TDS structure for Recurring Deposit same as Fixed Deposit. Earlier no TDS was deducted for RD deposits. The entire interest earned is added to the income and taxed according to the income tax slab rates. TDS of 10% is deducted if the annual interest exceeds Rs 5,000. The interest earned on bonds/NCDs is fully taxable as per income tax slab rate. TDS of 10% is deducted if the annual interest paid exceeds Rs 5,000. However, there is NO TDS if the bond/NCD is held in Demat form. In case the bond/NCD is sold through exchange before maturity, it entails capital gains. If the holding period is less than 1 year, it is Short Term Capital Gains and taxed according to income tax slab. For holding period of more than 1 year, the gains are Long Term Capital Gains and are taxed at flat rate of 10%. There is no indexation benefit available. As the name suggests the interest earned on tax free bonds is tax free. But if tax free bonds are sold before maturity, it leads to capital gains. Interest up to Rs 3,500 for single holder account and up to Rs 7,000 for joint account in Post Office Saving Account is tax free u/s 10(15)(i). The remainder interest will get added to your income and will be taxed at the applicable rate of income-tax. There is NO TDS on Post Office Saving Account. Also this exemption is over and above tax exemption offered by 80TTA. Example: You have Rs 9,000 interest from Bank account and Rs 5,000 from Post Office Saving Account; you can claim Rs 3,500 tax exemption u/s 10(15)(i) for post office account and Rs 9,000 for bank account & Rs 1,000 for Post office account (total – Rs 10,000) u/s 80TTA separately. The interest received is added to income and taxed at marginal income tax rates. 40% of corpus should be used to buy annuity. The monthly pay out received is fully taxable. Maturity amount received form EPF is fully tax free if you have continuous service of more than 5 years. In case the service period is less than 5 years, the amount is taxable as per income tax slab rates. TDS at 10% is deducted for premature and taxable withdrawal of funds from EPS, if the payment is more than Rs 50,000. In case the PAN information is not furnished the TDS would be deducted as 20%. Any scheme which has more than 65% invested in equities is treated as Equity Mutual Fund. If the investment is held for more than 1 year, the gains are classified as Long Term Capital Gains and are taxed at 10.4% (changed in Budget 2018 and effective from April 1, 2018). In case the investment duration is for less than 1 year, the gains are Short Term Capital Gains which are taxed at the rate of 15.6%. Dividends received are tax free but funds deduct DDT (Dividend Distribution Tax) of 11.648% before paying. If the investment is held for more than 3 years the gains are classified as Long Term Capital Gains and are taxed at 20% after indexation. Short Term Capital Gains are added to the income and taxed at marginal tax rates. Dividends are tax free in the hands of investor but funds deduct DDT (Dividend Distribution Tax) of 29.12% before paying. Dividend incomes up to Rs 10 Lakhs are tax free. Any excess dividend is taxed at 10% flat rate. If the investment is held for more than 3 years but before sold maturity the gains are classified as Long Term Capital Gains and are taxed at 20% after indexation.Short Term Capital Gains are added to the income and taxed at marginal tax rates. The interest received is tax free. Also there is No Capital Gains Tax on the appreciation in the value of gold deposited. The final proceeds are tax free if the premium paid for all the years are less than 10% of the maturity amount. TDS at 2% if the total receipts exceed Rs 1 Lakh. Service tax is applicable on premiums paid. The maturity amount is tax free if the premium paid for all the years are less than 10% of the maturity amount. A standard deduction of 30% is allowed on rental income. Thereafter the rent received is taxed at income tax slabs applicable to you. You can also claim deduction for interest paid on home loan. There is no limit of interest deduction for rented home. Budget 2017 has limited the deduction to Rs 2 lakhs irrespective of property being rented or self-occupied. Additional deduction can be availed for repairs, home insurance, property tax, etc. The gains are long term capital gains if the property is held for more than 2 years [Budget 2017 brought the holding time to 2 years]. In this case it’s taxed at 20% after indexation benefit. Short term capital gains is taxed at marginal tax rate applicable to you. Can I take benefit of both?? OVER ALL GOOD INFO IN SIMPLE LANGAGUE WITHOUT MUSH SECTION & SUB SECTION. Nice and informative article. Thanks for such a useful update. Very informative and well compiled. Believe capital gains up to 1 lakh is tax free. Is this true only for equity or MFs too? Yes standard deduction can be claimed from EPS pension (though there may be difference of opinion by some experts but as per me this is allowed). I am having a pension plan namely, Life Stage Pension Advantage, from ICICI Prudential Life Insurance. The commencement date of the policy is, 09-01-2010 & the maturity date is, 09-01-2020. The policy has been converted into paid-up policy after paying five consecutive annual premiums. Please advise me about the Tax Implications of this surrender. Great Contribution by Mr. Amit Kumar. I have get familiarized with so many schemes. Thanks a lot for selecting this topic. Very well explained and easy to understand. Some of the provisions are old dated and not correct for the current FY. Point No. 23: Property holding period has been reduced to 2 years. Point No. 22: In both the cases, whether rented or self occupied, the interest deduction is capped at Rs. 2.00 lakhs. Point No. 5 and 15 are inconsistent. In both the cases, for STCG, the holding period is 3 years while for LTCG for more than 3 years, the tax is 20% with indexation. It seems that this is an old post, relevant to earlier years and has been reproduced with/without author’s permission. Please check and revert back the latest status. Thanks for pointing this out. This indeed was my old post which I republished – sorry for errors. Have changed the tax treatment related to rental & property which was proposed in Budget 2017. However taxation of NCD & Mutual Funds are correct in the post. Thank you for pointing this out. Have corrected it now!